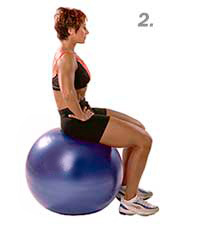 Sit on Swiss Exercise Ball with legs bent, knees over ankles. Place hands on hips. With control, use the abdominals to move the pelvis forward and backward. Imagine rolling your tailbone toward the front of the ball, then toward the back of the ball.